Do you know how can be reduced the maleficent effect of sedentary job? 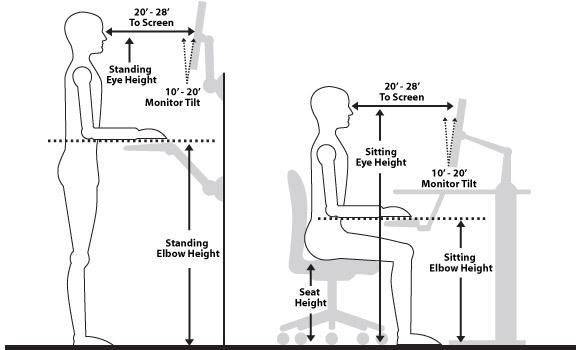 Or what are the proper settings of chair and screen at the computer? Back pain and spine problems as side effects of sedentary job is a widespread disease nowadays. Go over the following branch of advice and use in your daily life as much you can. Beware of that your eye and the top of the screen are in the same level. When you keep your upper arm vertical and the forearm horisontal then your hands and fingers are just on the keyboard. 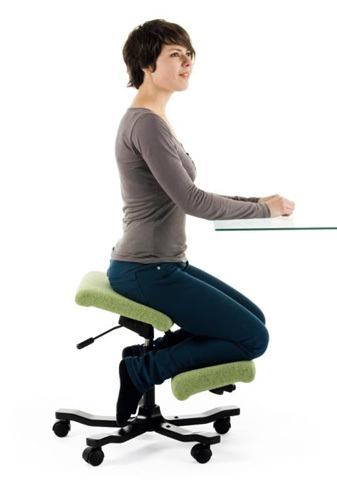 The ideal hight of the seat if your thighs gently slope down to the knee while the soles are fully placed on the ground. Sitting slipped down for a long time is not recommended. It is better if your back is straight, but a small compact pillow behind your lower back area is pleased. The bad side of the last one is that your weight will push the ligaments of the bended knee. The knee can support a big weight if it is straight, bone under bone. But the most important would be having a short break regularly for moving and body exercises. The signs of sedentary job manifest mainly at the neck and shoulders area as knots and stiffnesses in the muscle. It can be a common mistake to move your head closer to the screen which stretches your neck as well and distorts vertebrae into steps like shape. On the other side while using mouse you have to keep you entire arm in a good position and under controll. Muscles of shoulders have to work a lot contracted which reduce blood circulation. Thus oxygen, water and nutriment can not diffuze so its condition starts running down. Take a small piece of high coloured Post It and stick on the top of the screens’ frame. The addional meaning of that piece of paper is that „it’s time to check your head’s and neck’s position”. When during the day your eye catches it then you will know why is it there and you will correct the position. It’s a kind of coaching to build up a new habit. If you get accostumed to the colour, you can change it.